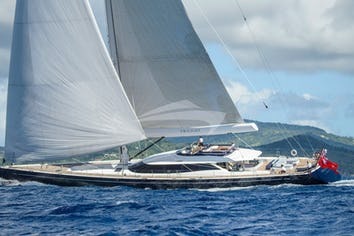 Architectural Digest has called Seahawk the " Sexiest Yacht in the World"! Seahawk’s interior was designed and styled by famous French designer Christian Liaigre, who has created a refined and contemporary ambience with strong marine accents. The Guest accommodation are serene, spacious as well as versatile. Master Stateroom - includes 2 Queen beds; One bed 173x196 facing aft on the Starboard side and One bed 173x196 facing forward on the Port side. The Full beam master stateroom can be divided into 2 separate staterooms each with their own entry and bathrooom with shower. The Port Aft Guest Stateroom includes a Queen bed 180x190 and a raised bunk bed 70x190. The bunks headroom is 80cm. The Starboard Aft Guest Stateroom includes a Queen bed 172x197. The Port and Starboard Guest Staterooms forward both include bed 124x210 at the head and 110 wide at the foot with an additional settee 68x198 and a Pullman bed rated for 75kg. The headroom in the guest accommodation is approximately 204cm. All staterooms include ipad minis to access all Entertainment functions as well as lights, air conditioning and window shades, Crew Call and even Seahawk's speed, heading, CCTV, Radar and google earth server showing tracking. There are also ipod docks for guests to plug in their personal collections. Functions are also available with Crestron remotes and touch panels mounted in each cabin. Sky TV, English Sky TV, American Direct TV, German Sky, Apple TV, Blueray, Digital Terrestrial TV, Audio Radio, 3D TV available in all guest cabins. 55" Flatscreen available on the flybridge for alfresco cinema. Wi-Fi is available throughout the yacht with 9 access points including on the mizzen mast for outdoor access. All cabins have Cisco phones which use wireless. Voice is available through VSAT Seatel MTN 256kbps up/512kbps down, 3G GSM/Simcard, Fleet broadband, internal Cisco PBX system and a separate SAT phone. Voice is available through VSAT, GSM, Fleet, PBX and a separate SAT phone. 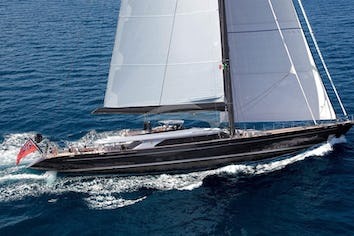 SEAHAWK is the first sailing yacht in Perini Navi's new generation 60m line. 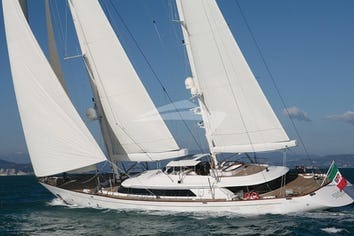 Seahawk is an aluminum ketch designed by the naval architects at Perini Navi with a sail area of 2,125 square meters and two aluminum masts of 62 and 52 meters, respectively. For the first time on a Perini Navi yacht, the booms are made of carbon fiber and so are the foils and the bright red standing rigging. The builders installed a new generation of fully recessed furlers for the furling of the headsails and developed the new captive winches to help increase tacking speed to under a minute!